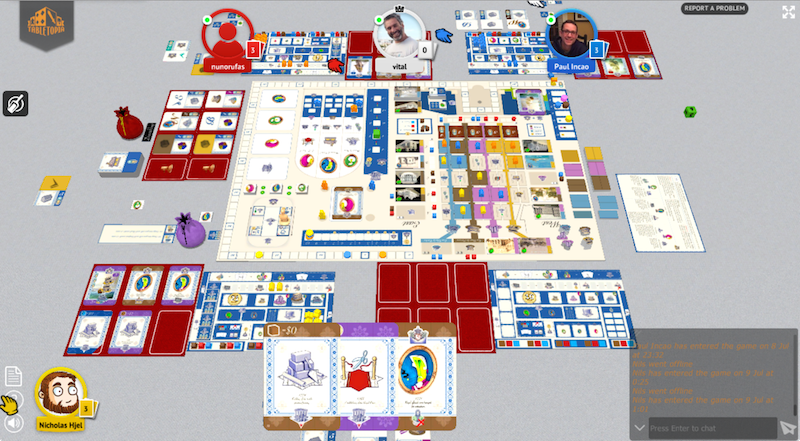 Last week I was given the opportunity to play test Vital Lacerda’s next game Lisboa on Tabletopia (”Table 35”). My understanding is that Lisboa is near completion but that minor adjustments may still take place in the final version of the game. Hence, this preview will not focus on details but rather attempt to capture the gameplay and what it feels like to play Lisboa. Tabletopia Table 35: The yellow newbie (me) has just won thanks to strategic building majorities in the city center (or perhaps I was just lucky). Lisboa is set in the reconstruction of the Portuguese capital after the great earthquake of 1755. The game literally starts with the earthquake, simulated by covering the city map with cubes (”rubble”). The players take the roles of nobles using their influence to contribute to the reconstruction. They do this by playing event cards to trigger actions that let them manage money, influence and goods and to engage in politics, trade and building. Lisboa ends when the remnants of the old city center has been cleared away and the new one has risen. The first that came to my mind was how well the mechanisms and the theme go hand in hand. As a euro gamer, I’m usually more interested in inventive and elegant mechanisms than elaborated background stories. Nevertheless, a game where the mechanisms makes me feel like I’m part of the history by letting me face the decisions of the real men and women of the time always score high in my books. What Lisboa does is to capture economic considerations (how do I finance the buildings?) as well as political considerations (how do I get support from the government?). Let us look closer at those decisions. Basically, my success is measured in victory points (wigs). To succeed, I need money and influence to build the buildings. To get money and influence, I need goods, and to get goods I need… buildings. This is a challenge that puts Lisboa apart from many standard euros, where you typically build an engine and follow the route money->investment->more money->switch to victory points. Instead, you have to juggle many different resources (money, influence, goods, officials etc.) and understand how they all relate to each other. Typical questions you ask yourself during the game is not only how to get a resource but also how to use it once you get it. The city scoring mechanism deserves a paragraph of its own but I must admit I haven't fully understood how you best use this "multidimensional multistep rocket" to your advantage. Do you play tactically for the best rewards, the cheapest land or the most expensive goods? Or do you play strategically for the most victory points and if so, do you play for majorities in colors or to dominate rows or columns? Do you open the public buildings yourself or do you "tailgate" on other players' rows and columns and wait for them to open public buildings that earn you victory points? This is a game in the game that still blends very well with the other mechanisms. The depth of the decisions gives newbies the challenge of too many decisions and it probably takes some games to fully understand this intricate web of interdependencies. Nevertheless, the game never comes to a full stop; you always have things to do and you cannot ”break your own game” and leave yourself with no possibilities to act. Let us move on to the actions or the execution of the decisions. It's deceivingly simple: you manage a hand of noble cards and treasury cards and play one each turn. But each card has several branches. Do you play it to your portfolio, to get long term benefits, or do you play it to the court, to get powerful actions? Which of the actions do you choose and which of the action benefits do you choose? You must also plan your actions so that you have the resources you need now and get the resources you need later. And of course, the actions are all linked to historical persons and events. This does not mean that you are dependent on lucky draws. The cards available for replenishment are open. The cards held by your opponents are open. There is a small randomness in which cards get available but the control remains with you. This leads us to the interaction. Lisboa is not a solitaire puzzle. Yes, you can plan your actions but the cost and gain of them are affected by the other players' actions. Do they produce goods? Then the prices fall. Are they present at the court? Then it costs more influence to get there. Have they started to clear a street? Then it is cheaper to build there but you will increase the value of their buildings as well. But since all the players' cards are open, you can predict what they are up too (and since you can do so much with them, it's not about knowing many cards, it's about guessing what they will do with the few they have). Finally, let us assess the tension throughout the game. Resources are scarce in the beginning but do they continue to be so? It is true that you get more goods throughout the game but the goods prices go down, the ship prices go up and you need to recruit more officials to open buildings so you never have enough goods. As influence and money are concerned, I felt that they became less scarce, since cards and tile abilities increase influence and decrease costs while land gets cheaper the more rubble that gets cleared away. However, this is something that the developers were aware of and look into and I am confident that the final version will have adjusted the balance to perfection. We have covered more than enough for a game and not even mentioned mechanisms like follow other players' actions, selling to other players' ships, unlocking abilities and competing for majorities in the city. Yet, Lisboa never feels overloaded as all of them are part of the same web and well integrated with the theme. This allows the players to set up and follow a strategy while staying attentive to tactical opportunities on the way. Last but certainly mot least a few words about the art. There are a lot of spaces on the board but thanks to the clear symbols (of which, I understand, most were finalized at the time of the play test) it never feels cluttered. The symbols are also large enough to be distinguished across the table, on the other players’ player mats. Some specific symbols, particularly the ones illustrating the clergy tile benefits, were a bit hard to interpret so perhaps a symbol list on the player aides would help in the first few games (after which I expect you will have learned them by heart). I also like how the modern art of the nobles helps conveying the message of a city rising from the disaster by leaving its past behind and entering the modern age. It has been a privilege to play test Lisboa and I look forward to see the game come true. This review was also published at The Quest for the Perfect Game - Reviews by Gamers for Gamers. This sounds like another must-buy game from Vital. Very good review and looks like you are +1 to enjoy it. I've played the game several versions back and had enjoyed the game a lot so I think it is only better now. Something different from Vital but has enjoyable has the previous games he has done. A must buy for me for sure. Who cares about a detailed description of mechanisms and game turns when you can read this kind of review. Thank you so much for sharing your thoughts with us. You just made me more interested in the game. This makes me want this new game even more !! Nicholas, thank you for playtesting Lisboa and thank you for writing and publishing this excelent article. I hope you enjoy even more the final version of the game. Thank you for all kind words! In my reviews, I always strive to capture what it feels like playing a game rather than repeating the rules and I hope I have succeeded in this case. And yes, Lisboa is a must buy for me too. The interaction of money, influence, and buildings sounds a lot like my favorite game - The Gallerist. Can you give any comparisons between the two? Very excited for this one. Is it going to come to KS as a deluxe version like the gallerist & vinhos reprint? I would love to but unfortunately I haven't had the pleasure to play The Gallerist (but I want to now!). Being the publisher the same, I think yes, it will. I certainly think there is scope for this. Guess I will start saving my money for this KS to launch. Curse you Vital and your mutant ability to make such excellent games. Where would you rate it in terms of comparison with Vital's other titles: Vinhos, CO2, Kanban and The Gallerist just from your initial perspective thanks Nicholas? I would ask Vital but I know his favourite is always his latest design. From the 5 games the only one I didn't played at least once is CO2. Gallerist is my favorite game from Vital. After this one I can't decide between Lisboa or Kanban. Maybe Lisboa since I like very much how you handle the cards, although I didn't played with the latest rules yet. I felt that Lisboa offered me more strategic paths and more control. If a player went in my way in CO2, it was not much I could do about it, while a good hand management in Lisboa allowed me to keep several options open. Yep, it's on my list too. Maybe we can double up again. I've now had the pleasure to play The Gallerist as well and can elaborate on my answer. There are definitely similarities between the two. You have relatively few actions to choose between but with profound tactical and strategic implications. You need to plan a chain of actions to accomplish interim targets. You manage a player board where you can unlock various abilities. You can "piggyback" on other players' turns. You can influence market values affecting all players. But although The Gallerist is a great game, I feel that Lisboa goes one step further. There seems to be more paths to evaluate and explore, the gameplay feels more dynamic with fluctuating market prices and changing court presence, and the web of interdependence is so intricate that each action will have a subtle but important effect on other players. One example is a comparison between the international market of The Gallerist and the city of Lisboa. Basically, both are "victory point grids" but the former felt like a point salad that distracted a bit from the theme of being a successful gallerist whereas the latter forced me to think like a city builder (what's the long term value of my building, how can I maximize my own return, how can I take advantage of other players' buildings etc.). In sum, if you liked the Gallerist there's a good chance that you'll like Lisboa as well. In sum, if you liked the Gallerist Vital Lacerda, there's a good chance that you'll like Lisboa as well. I have played only once on Tabletopia (3 players game) and i have the same thoughts about tension on money and influence. The OP said that the developers were aware about it but how this aspect of the game was/will be adressed (if so because the rulebook is said to be 'final') ? Sure, you can screw yourself by bad play/timing/tempo/planning but this will delay your moves and slow you down. Don't get me wrong, this is not a bad thing. But before backing, i just want to know if something will be changed or not in the game. I've had the chance to play Lisboa on Tabletopia a couple of months ago in the final phase of playtest. Through really bad but imaginative play I managed to get stuck in a bad situation, and had to struggle hard not to finish last (which eventually I did). I didnt' feel influence and gold are so plentiful. You're going to spend them a lot: in the second half of the game opening shops andpublic buildings is very important, and you need influence to do that. You can also spend it as money, and that's useful, but consumes it. Also taking decrees is important, as they give you points. Keeping your influence high is also a source of Wigs. And the price of going to court increases due to more presence of other players' officials. As the OP played in table 35 and I played in table 36, I think the added rule about "plenty influence" has been (but I can't know for sure) that the cost of visiting a noble is the number at left of treasury marker + officials. I can speculate that before it was just officials. So I think your concerns have been already resolved. Anyway I don't think a good game needs to be unforgiving. If it was that way, you could play only half of it to see who's in front halfway through. Comebacks are fun! Sorry for the late reply but if I remember correctly, this rule was not in place in my table (35) but discussed and apparently added already in table 36. Another great example of how important fine-tuning of seemingly small details are in game development. I also agree that games shouldn't be too unforgiving.